I just love making & giving explosion boxes. The surprise people get when they open their seemingly innocent box and the walls fall down seemingly as though it is exploding, is just precious. 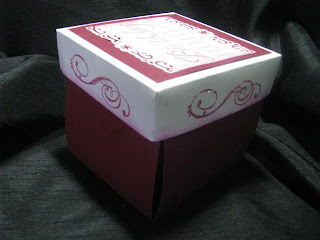 The flowers in this box are similar to one that I made for my second daughter's 21st some 2 years back. 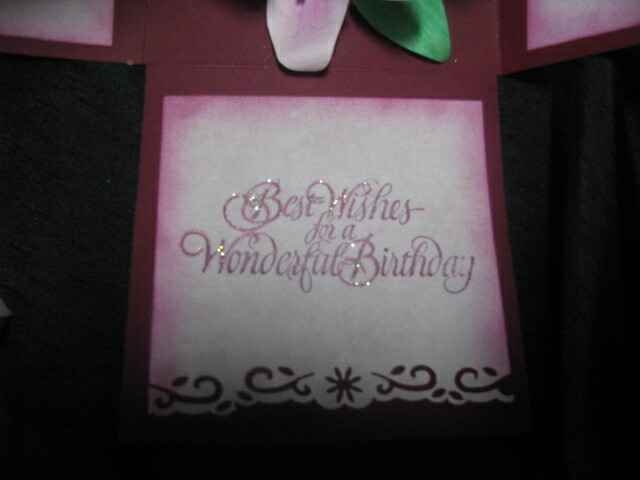 Asiatic Lilium are her favourtie flowers and so I took it upon my self to figure out how to make these wonderful flowers. 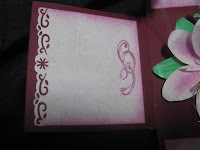 I used Joanne's Mainly Flowers blog entry as a starting point and modified it from there. 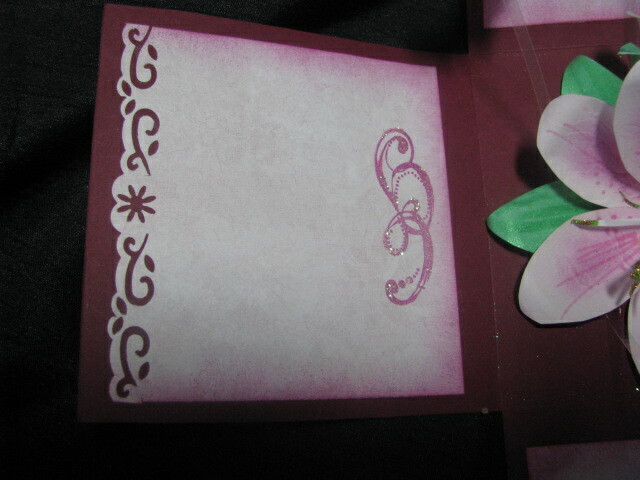 The petals were hand cut card which I coloured using sponges & pink ink and a pink art pen to draw on the spots. 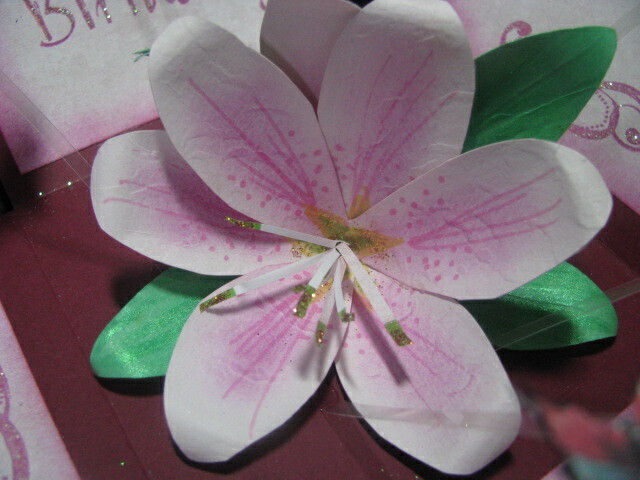 I then proceeded to roll the petals into shape and glue around the card stamens that I had cut in a quilled style, flaring out the tips and adding a touch of glue & glitter to them. I stamped, coloured and border trimmed white panels before adding a touch of glitter to the words & the swirly designs. 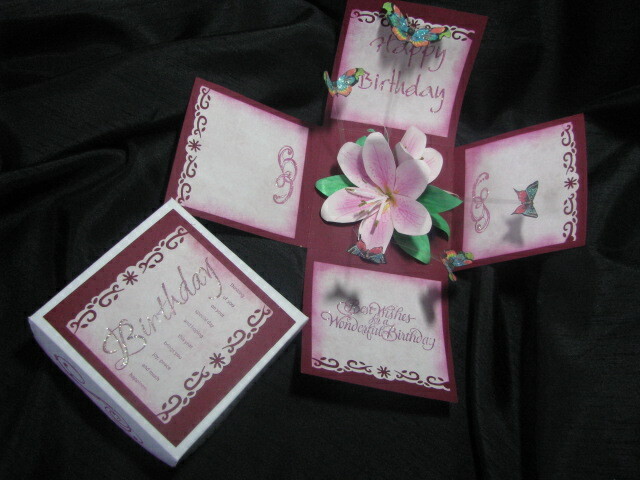 As usual there are my 'trademark' butterflies fluttering around.If you are interested in this or one of my other explosion boxes then visit my Zibbet shop. Do drop a line. I would love to hear your comments.